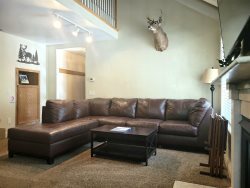 Discounted Unit: One Bedroom & Loft & Two Bath Condominium in the Scenic Meadow Area of Mammoth Lakes. Sleeps up to 6 (approx. 1100 Sq. Ft). This spacious 2 story unit has vaulted ceilings and you walk up one flight of outside stairs to enter the unit. Corner unit is bright with lots of windows to let the light in and is near the pool/spa area of the complex. The first floor is the Bedroom, Kitchen, Dining Room, Living Room and 1 Full Bathroom. The second floor is the Loft and the 2nd Full Bathroom. The Loft is open to the living room by a half wall. The Master Bedroom has 1 Queen Bed and the Loft has 2 sets of Bunk Beds one with 1 Full on the bottom & 1 Twin on the top, and the other has 2 Twins. There is not a fold out couch in the living room. There is 1 TV in the Living Room and a VCR/DVD, stereo/CD player. Phone in unit 760-934-5850. Wifi Available. There are two outside parking spaces available. Sunrise Condominiums offer a Spa, Seasonal Swimming Pool and Sauna. Coin-operated laundry facilities located in the common area near the office. TOT LICENSE 807-SR37. The place is bigger than it looks! Thanks. We had a great time. It is a nice loft-y space. We enjoyed it a lot. Easy trip to Mammoth! From check-in to check-out, they made it really simple! The place was great and had everything that we needed! Except Wifi. It would have been nice to have especially since for some reason both my friend and I had zero service for a morning (we both had T-Mobile). Anyhow, we knew this had no wifi when we booked, but we decided to go with this booking as it was our best option at the time. Everything was great, the only bummer is there wasnt any WiFi. Should be like having hot water these days. Great place to stay, easy access to the entire town of Mammoth. Super close to the famous breakfast dinner "The Stove." Recommend this place for reals. The condo was clean, well furnished, had enough beds for 7 (2 beds could sleep 2 people). It is very close to stop #4 of the red line bus making it easy to go to town or Main Lodge.